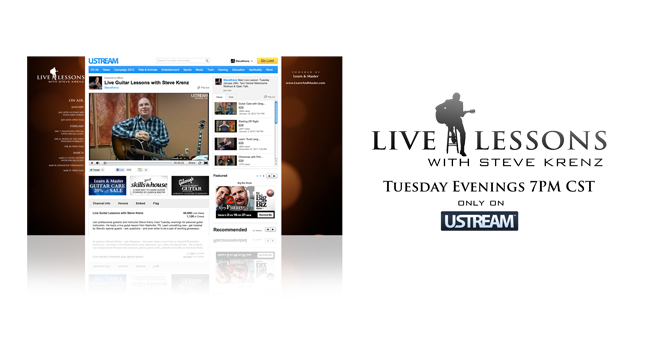 Learn & Master Guitar Live on USTREAM is a great place for students to meet Steve Krenz, Author of Gibson's Learn & Master Guitar. Every tuesday, Steve broadcasts live from Music City to a growing audience of Learn & Master students, guitar fanatics, music aficionados, and people completely new to the guitar. The hour-long broadcast is themed, so each one is completely different. Some broadcasts feature special guests, such as legendary guitarist Phil Keaggy, country artist Bryan White, and blues guitarist Will McFarlane. Learn & Master Live is the place for students to interact with each other, ask questions via Twitter and Facebook, and every now and then have the chance to win some sweet guitar gear.